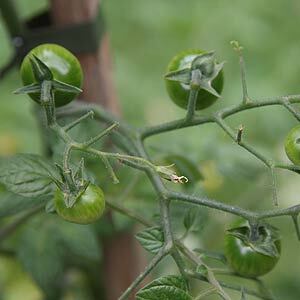 We always seem to have a great crop of them and are often asked, how do you grow cherry tomatoes? The answer is simple, they are the easiest of all of the tomatoes, and we grow them in pots. Cherry Tomatoes produce masses of small juicy tomatoes, and being small growing, make an excellent choice for a balcony garden or sunny courtyard. These particular varieties are good to grow in pots and containers for two reasons, firstly they are compact and secondly many varieties are early to ripen as well. The cherry tomato will requires some support, but most varieties have a much ‘bushier’ growth habit than some of their relatives. They also seem to fruit a little earlier. Pictured right, is a cherry tomato happily growing in a self watering container, fruiting earlier than most of our other varieties. We use a self watering pot for our cherry tomatoes, which does not mean you not have to water them, it just means that the pot retains some water in a reservoir at the bottom and the tomato will have access to this as the water ‘wicks its way up’ and the roots grow down. So we water a little less. In southern areas of Australia tomatoes are best planted in the the spring when the soil begins to warm. If you are growing from seed, start your cherry tomatoes off in a greenhouse, cold frame, or indoors late winter. In tropical climates plant in the dry season. On planting into the pot make sure you are using a high quality potting mix, and use new potting mix each year. You will need to stake, or use a tomato cage, so make sure your pot is suitable for this. We generally use 3 stakes in each container. You can actually make a cage out of broad mesh fencing wire and place it right over the pot if staking proves to difficult. We do not fertilise at all after planting, until the flowers begin to appear, we do not want to promote to much leaf growth early on. Once the flowers appear we use a liquid seaweed fertiliser once a week. Pollination is the key to fruiting and usually insects and wind will do this for you, we have heard of hand pollination, however we have never needed to do this (or even wanted to). You should not use any herbicides or pesticides on tomatoes as you are going to eat them. If you do have problems with white fly or similar try an organic solution, home made garlic spray is one. One of the best is the heirloom ‘Sweet Bite’ it flowers early, has a thin skin and is sweet and tasty. It can reach 2-3m in height and does have larger fruit than some others, but still great for salads. ‘Red cherry’ is a smaller growing type to around 1m. The famous heirloom type, ‘Tommy Toe’ will produce fruit for us from Christmas (with a warm spring) until April, very sweet, it will still reach 1.5m + in height, so staking is required. And if you are looking for tiny fruit, try ‘Wild Sweetie’, very sweet indeed, the fruit fit the name, they are the size of cherries.